And just as we’ve turned 4 (which seems as good as running 40 looking back on all that we’ve garnered! ), we’re super proud to have established our brand such that we recognized the top companies that were leading in DivHERsity in India. AccelHERate 2019 paved the way for our FIRST DivHERsity awards which saw over 300 companies participating. And as we tread into the month of International Women’s Day, we are surrounded by the madness of our Women’s March drive, one that centers around the launch of our very own communities – GROUPS on JobsForHer. 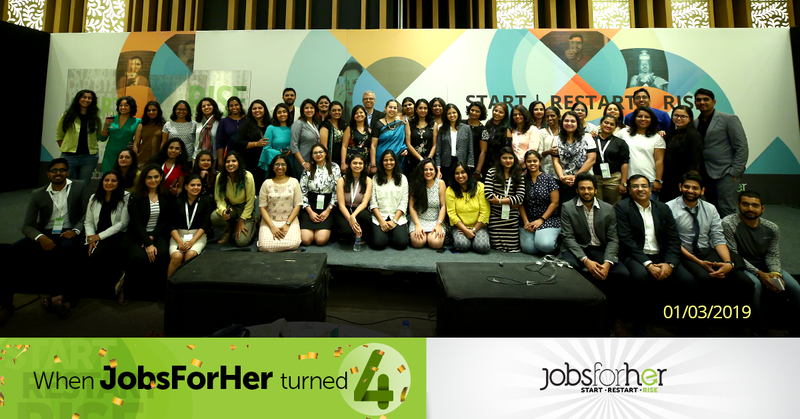 In the cover image: Filling-up-a-70-mm-screen picture is the current JobsForHer team at the end of AccelHerate2019 and DivHERsity Awards Gala, all set to partayyyy!! From working at Church Street Social to one (and then two) small office(s) in Frazer Town to a bustling 3200 sq. ft space on one floor (and now the 2nd). From launching with 20 brave companies to 750 diverse companies to 5000+ women-friendly organizations. From hundreds of monthly visitors to 50,000 to 1 MILLION women on our portal today. From focusing on career-break women in Bangalore, to women returnees across India to working women at any stage of their careers. From the embryonic team of 4 women to a still-growing team of 60+ women AND men, and umpteen volunteers and ambassadors. From helping women find a path back to the workplace and to their identities and self-worth, to building every other platform to sustain and nurture that finding, and their growth in the workplace. From Ready.Set.Restart. to START. RESTART. RISE. As JobsForHer marks its 4th anniversary today and looks back on the path traversed thus far, through all the blood, sweat, and tears, we rejoice in all that the years were. We own and celebrate our transformations. And we send gratitude to everyone and everything that has helped make it happen. We celebrate YOU and Us. 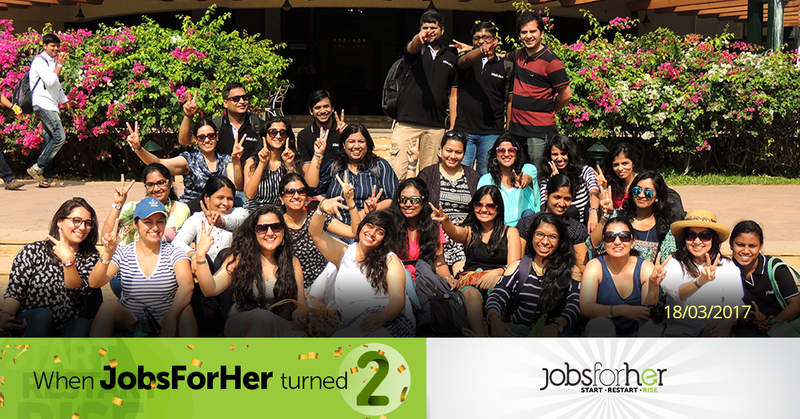 By the time JobsForHer turned 1, not only had we moved offices (even rented more space) to accommodate an ever-expanding team, we’d also realized that the women who were calling our attention were far beyond the boundaries of the city of Bangalore. Some, even from towns that we’d heard of for the first time. THAT is when we decided to go pan-India. And on 8th March 2016 - our first anniversary, we hosted our FIRST online recruitment drive across India for women returnees. 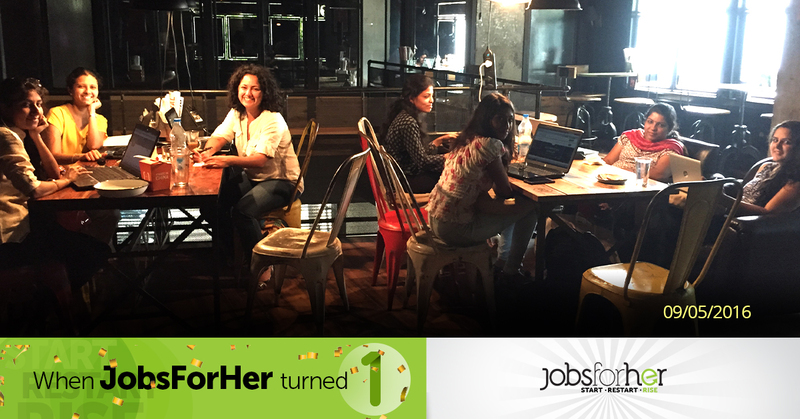 In this picture: Members of the team with whom JobsForHer started, working out of Socials on Church Street – our FIRST (co-working) office space! In the two years that went by, we scaled 10 times. In the number of women that were reaching out to us, the number of companies that were opening their minds and doors to women returnees, AND the number of members that constituted the in-house team. And with every year, we learned. With every year, we evolved. Year 2 unraveled that we had to do MORE than providing jobs. So, on 8th March 2017, we launched MentorHer – a platform that would give second career women the guidance and inspiration they needed from industry experts, to bridge the distance - inside their own minds and the world outside. In this picture: The JobsForHer team letting their hair down at their annual offsite. By the end of year 3, we were amazed at the way we were constantly redefining our vision and our roadmap (let alone our own in-house roles), to make space for all that our women candidates wanted to deliver on. 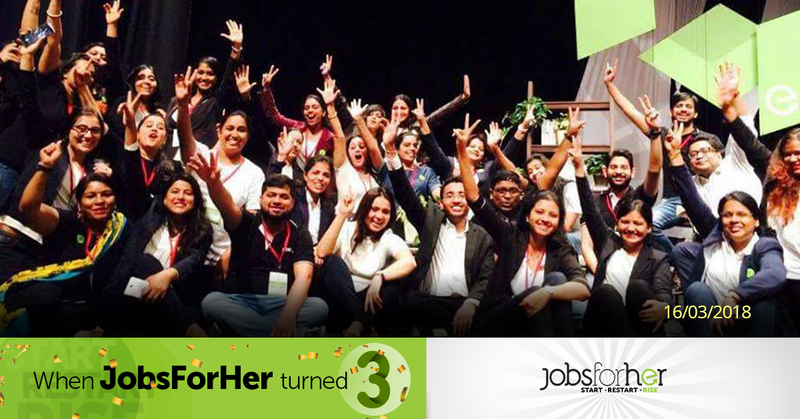 While the first half of our year was abuzz with the launch of our ReskillHer vertical - to provide courses, assessments and expert services for women returnees, AND hosting RestartHer 2017 – our FIRST and India’s largest conference and career fair for second career women; the second half of the year brought the excitement and madness of our FIRST big platform for our companies. 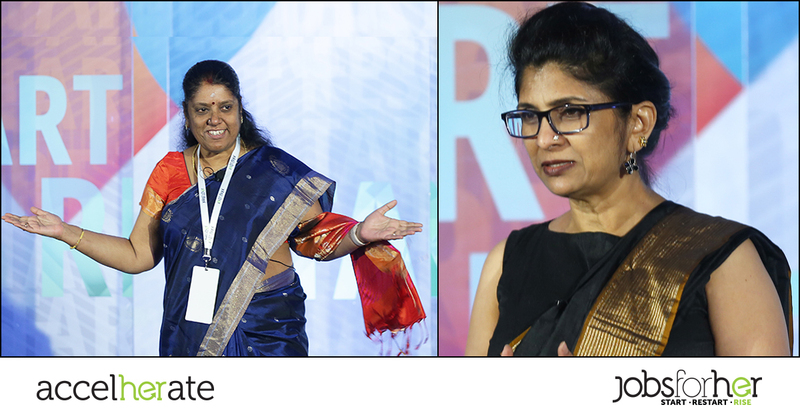 In March 2018, we hosted AccelHERate – India’s biggest B2B conference for companies accelerating women’s careers. And the runaway successes of these flagship events only left us inspired to DO MORE. To BE MORE. In this picture: At the end of RestartHer 2017, exhausted and exhilarated, all at the same time! What do you need to START.RESTART.RISE in your career?